This post was written by Andreu Font-Ribera. We live in a Universe that is expanding faster and faster, driven by a mysterious dark energy that amounts to 70% of the total energy density. However, it has not always been like this. The Baryon Oscillation Spectroscopic Survey collaboration has analysed the distribution of matter eleven billion years ago when the Universe was only one fourth of its current age, and we have shown that matter was the dominant source of energy at that time and the expansion rate was still decelerating. The expansion of the Universe started at an extremely fast pace. During the second hour after the Big Bang the Universe doubled its volume! Since then, gravity has slowed down the expansion by pulling objects together, and during the last 50 million years — since an asteroid ended the life of most dinosaurs — the Universe has only increased its volume by 1%. At the end of the last millennium however, two different groups reported that the Universe is not only expanding but the expansion rate is accelerating. What is causing the acceleration? Do we need to modify the laws of gravity? Is there something else in the Universe that is pulling galaxies apart? The short answer is: We do not know yet. In 1998 scientists started to use a placeholder for the answer, dark energy, and since then several experiments have been trying to figure out what it is. To learn about the accelerated expansion of the Universe, we need to measure its size at different times. We could wait several million years and keep track of the growth of the Universe, but those eager for an answer can also look back in time and measure its size when it was younger. Due to the finite speed of light, photons that we receive from distant galaxies have been travelling for billions of years. Images of distant galaxies show us how the Universe looked in the past, and the farther we look at, the earlier in time we can reach. The main challenge when studying the expansion of the Universe is how to measure cosmological distances. Our telescopes give us very accurate angular coordinates of galaxies, but it is not easy to tell how far they are. 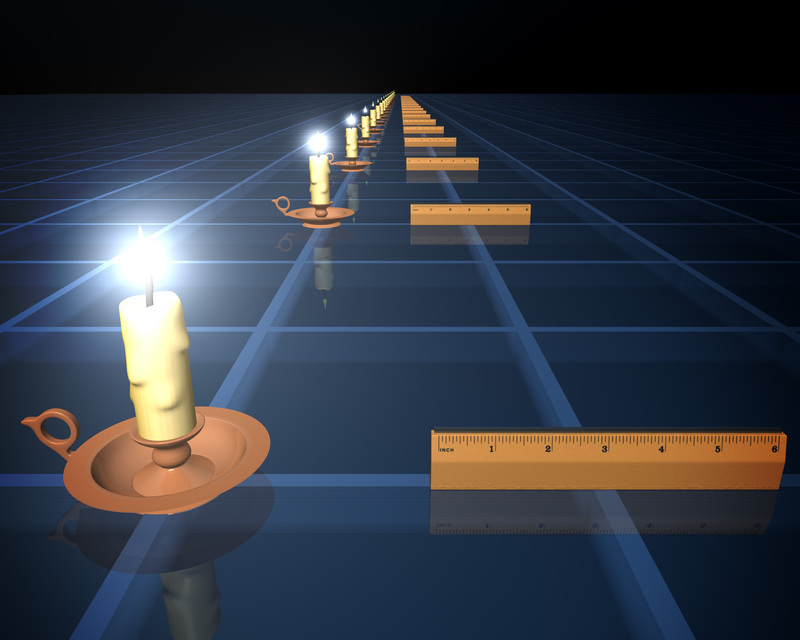 In the discovery of the acceleration of the Universe scientists measured distances using a technique known as standard candles. The flux measured from a given source decreases with the square of its distance. Therefore, if the brightness of a certain standard candle is known, one can estimate its distance by measuring its flux. The best standard candles to date are supernovae, a particular type of stellar explosion with a very regular brightness. Standard candles and standard rulers allow us to measure cosmological distances. Credit: NASA/JPL-Caltech/R. Hurt (SSC). An alternative technique, standard rulers, has recently provided the best distance measurements. The apparent size of a given object is inversely proportional to its distance. Therefore, if the absolute size of a certain standard ruler is known, one can estimate its distance by measuring its apparent size. A particularly useful standard ruler is the Baryon Acoustic Oscillation (BAO), a characteristic feature in the distribution of matter, originated in the very early Universe. Soon after the Big Bang the Universe was a very dense and hot plasma, and the competition between gravity and pressure caused acoustic waves to propagate across the Universe. The Universe cooled down with the expansion, and 400,000 years after the Big Bang protons and electrons combined into atoms and caused the waves to stall. These acoustic oscillations left a subtle imprint in the distribution of matter at a scale corresponding to the distance that sound waves travelled during these 400,000 years. Since we know how to compute this distance using atomic physics, we got ourselves a standard ruler! 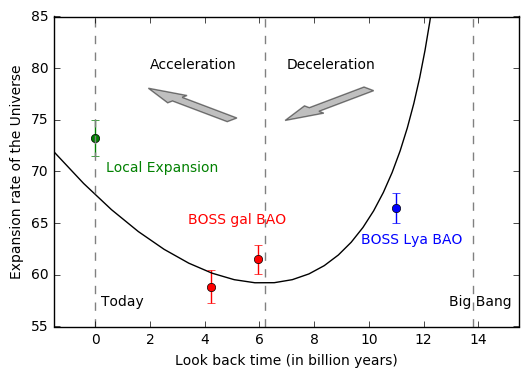 The BAO feature has been recently measured in the clustering of galaxies in the Baryon Oscillation Spectroscopic Survey (BOSS) , as described in this post by Marc Manera a couple of years ago. Using a catalogue of over a million galaxies, BOSS was able to measure the BAO scale very accurately and estimate the distance to the galaxies with a precision of 1%. Thanks to this measurement we can now confidently say that 5.97 +/- 0.06 billion years ago the Universe was one fourth of its current volume. Even though this technique has been very successful, it is difficult to use it at even earlier times, because farther galaxies are too faint for our telescopes. If we want to study the expansion of the Universe before dark energy kicked in, we need to be creative and use an alternative method. To study the expansion at earlier times, BOSS also observed hundreds of thousands of quasars, a special type of galaxy with an accreting black hole in the center. Quasars are hundreds of times brighter than normal galaxies, and this allows us to observe them even when they are far away. The light from the farthest quasar known to date has been travelling for over 13 billion years, so we see it as it was when the Universe was only 5% of its current age. Some of the light from these distant quasars is absorbed by hydrogen atoms that it encounters along the path towards Earth. This is illustrated in the YouTube video below, courtesy of Andrew Pontzen. This phenomenon known as the Lyman-α forest, allows us to map the distribution of gas in the distant Universe. When we analysed the absorption patterns in quasar spectra from BOSS we were able to detect the BAO feature in the distribution of intergalactic hydrogen and measure the expansion of the Universe eleven billion years ago. This result, shown as a blue data point in the figure above, confirms that the Universe was indeed decelerating at that time and was still dominated by matter. The final results from the BOSS survey are published in Bautista et al (2017, accepted for publication in Astronomy & Astrophysics). University College London is one of the founding institutions of the Dark Energy Spectroscopic Instrument (DESI), an international collaboration that from 2019 to 2024 will increase the size of current spectroscopic data sets by an order of magnitude, and will provide an unprecedented measurement of the expansion of the Universe. We are ready to learn more about the Universe, this is just starting!